Gold jewellery demand turned positive on the auspicious occasion of Dhanteras on Monday. Consumers booked for the ongoing festival and ensuing wedding seasons, seemingly in anticipation of a further spike in gold prices. 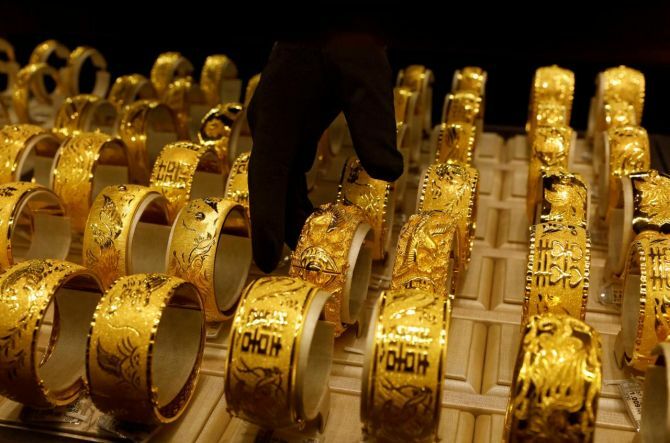 Gold was 7.2 per cent higher on Monday, at Rs 31,760 per 10g, as compared to a year before. Demand had been slack over recent months as prices went up. International prices had dipped but the rupee's fall ensured prices in India stayed high. As a result, while footfalls at jewellery stores had picked up, individual customer buying was low. Even so, festive sentiment picked up as Diwali neared. Dhanteras' buying seemed to have been sparked by the belief that prices would remain firm. Another reason was that jewellery manufacturers across all major cities offered a good discount of up to 50 per cent on making charges. Some are offering freebie coupons on purchase beyond a threshold. “Jewellery sales have risen by 7-10 per cent this Dhanteras. Buying sentiment has turned favourable in the past two days, giving robust festive sentiment for sales,” said Nitin Khandelwal, chairman, All India Gem and Jewellery Domestic Council. However, most of the buying was in the day's later hours. Rajiv Popley, director, Popley & Sons, said they had a nearly 20 per cent jump in sales. Somasundaram P R, managing director of the World Gold Council's office in India, said: “The recent sharp increase in prices could weigh, though, on the consumer wallet, limiting purchases during this season. "Anecdotal feedback from industry suggests that though footfalls seem to be good, demand could be moderate. "Organised players seem better placed, a trend that has become evident in recent years after a spate of transparency measures. In a similar vein, Saurabh Gadgil, chairman, PNG Jewellers, said: “Buyers are not only looking for discounts this festive season but are also evaluating the total value composition, keeping in mind the making charges, certification, product quality, designs, brand legacy, goodwill, after sales service and overall buying experience. Customers are opting for both types of gold investment - physical and digital gold. It is of great significance for Indian investors to have tangible gold in their hands and at their homes to feel secure. It will take time for customers to accept sovereign gold bonds or e-gold, though both are now on offer. Kumar Jain, director, Umedmal Tilokchand Zaveri, a bullion dealer and jewellery retailer, believes gold ornaments of lower size and caratage are high in demand as compared to the mid or high-end ones. Navneet Damani, an analyst with Motilal Oswal Financial Services, said: “Gold has underperformed many asset classes for some years. In the past couple of months, it has been consolidating in the range of $1,180-1,220 an oz, despite high volatility in the dollar following the escalating trade war between the United States and China. He is, however, optimistic for good returns in gold for the coming Samvat (Hindu calendar year).